Insight: What did my readers have to say? Note: The above quotes are excerpts that were taken from the comments and may not be the comment in its entirety. If you’re interested in reading the entire conversations, you can find the conversations here. Are the audiences of the separate blogs distinct? Is there enough content overlap to justify merging? Will your readers be confused by the change? Will the new site meet her readers’ needs? Background: Why merge three sites into one? When I met Doreen Pendgracs in 2011, she already had three websites. One was a static HTML author site and the other two were WordPress blogs. Shortly after meeting her, she built a 3rd WordPress site to promote her upcoming book Chocolatour. When Doreen built those sites, she was targeting specific audiences. Originally, her static website had served as a place for editors (and people wanting to hire her as a freelance writer) to see her work. However, since she couldn’t blog on that site, she launched a WordPress blog about writing and lifestyle experiences. Shortly after, she launched a travel blog. Finally, she launched a third blog to promote her upcoming book “Chocolatour: A Quest for the World’s Best Chocolate – Volume One“. Recategorizing: Was there enough content overlap? While Doreen’s separate websites were originally meant to target different niche audiences, there was a common thread between them. Over the years, the topics she covered blended and overlapped. Like many bloggers, she had created blog categories as she wrote. 40% of her posts were categorized as travel. 25% of her posts were categorized as writing. 15% of her posts were categorized as her book Chocolatour. 70% of her posts were categorized as travel. 20% of her posts were categorized as her book Chocolatour. 10% of her posts were categorized as lifestyles. 50% of her posts were categorized as writing. 35% of her posts were categorized as lifestyles. 10% of her posts were categorized as travel. 5% of her posts were categorized as her book Chocolatour. Note: Please keep in mind that the above calculations are approximate but they are indicative of the content overlap which was one of the deciding factors in her decision to merge her blogs. To give you a better look of what her blog content looked like, take a look at the pie charts below. Please keep in mind that these are prior to merging. Note: The percentage of posts from her “travel ” category includes posts previously categorized as “chocolate travel”. Also, posts previously categorized as “chocolate” and “chocolate events” are included in her “lifestyle” category. 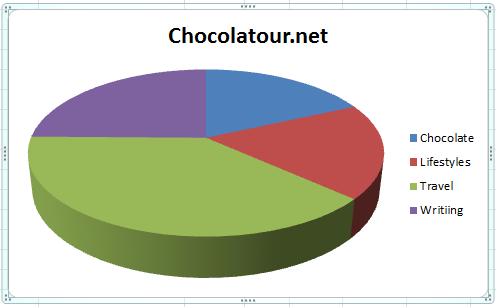 When Doreen had her three sites, she used the category “Chocolatour” to classify posts about her book, promotional events, etc.. When she cleaning up the categories on her old sites (before consolidating them), she made the decision to eliminate that category. After all, her strategy is now that “Chocolatour” is a brand. In the chart above, the blue columns represent the totals from the three separate sites and the red columns are the new website. As you can imagine, comparing this data is challenging. The official launch of the consolidated site was July 16, 2015. Prior to that Doreen spent a good part of June and the beginning of July preparing her three sites to be merged (including recategorizing her posts). Therefore, I chose to compare the four month period ending June 15th to the four month period ending November 15th. The difference between the total sessions shows a decrease of -3.60%. The difference between the total users shows a decrease of -6.73%. Since we know that many of Doreen’s readers were visiting two or more of her sites, we would expect to see the number of sessions and users to decrease some. The almost 10% increase in page views is encouraging. To me, it appears that people are reading content that they weren’t before. For example, visitors to her travel blog may now be reading her writing blog (and vice versa). Further Analysis showed that the “Avg. 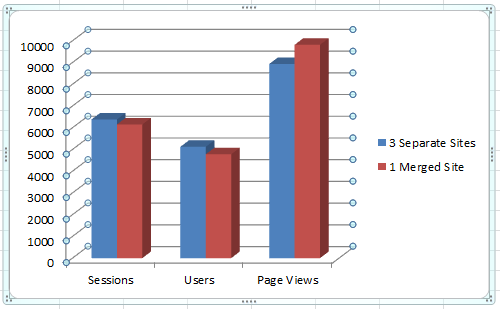 Session Duration”, “Pages/Session”, “Bounce Rate” and “% New Sessions” remained relatively consistent. Overall, both Doreeen and I are optimistic that she is well on the way to establishing her new brand. The feedback that she has received so far has been positive. What are your thoughts? If you had been thinking about consolidating multiple sites are you encouraged or discouraged by our results so far? Do you still have questions? As always, please feel free to weigh in. I have three WordPress sites on different niches. One is for blogging tips, second one is gadget related and a regional language blog. I was using a single domain for first two blogs earlier, but later thought it’s not good to show various categories in a single site. I was writing on technology, social media, gadgets, apps, games, blogging tips, science, business, how to guides there. Recently I divided them between two sites. I appreciate your idea and thoughts. Have a good time ahead ! I have been wanting to merge my sites since quite a while but always had a small doubt at the back of my mind that prevented me from doing so.I really appreciate your detailed and crisp case study and it has helped me alleviate my doubts and I think I will give it a go and let you know the results. I just found you via Biz Sugar and I wish I had found this post earlier. I had a couple niche sites that I toyed with the idea of merging back in 2014, and I took the plunge in 2015 mainly because one site would be easier to manage than multiple. Wrong move for me! As a result, my site ratings fell so low…I am now in the process of separating them again. Tough luck! It really is a matter of trial and error; that was the case for me and it definitely holds true. Thanks for having this conversation and keeping it going! Thanks Doreen and Sherryl for sharing these important insights and statistics. I think the answer to your question is “it depends” whether you have one or more sites. If you have a very defined niche then a single site seems to be the way to go. But what happens when your business takes a new direction or you start to wander off the topic you’ve been writing about for years? Is it confusing to readers? Can simply categorizing the content take care of the problem? I’m speaking from experience as I’m not sure my own website represents what I’m actually doing for clients and my own personal interests that I like to write about. I don’t think there are easy answers. But I’m glad that Doreen found what’s turning out to be the ideal solution for her. Hi Sherryl, First of all, thanks for the insights. Well choosing to consolidate multiple sites into one depends on a lot of factors. For example, if someone writing on different very narrow niche directories then it is better to combine them into one. However, if the categories or niches are entirely different then it would be better to leave it alone. Especially when you are getting a healthy traffic. Hi Sheryl, It’s really hard to manage 3 website with just a single person. Thank you for this case study and for giving us the stats and ideas for merging 3 websites. Maybe Doreen think it’s ok for search engines to merge because it has the same categories on all 3 sites. I wouldn’t do that, but yes, it all depends on the niche I am in. But if followed the right approach different sites can be consolidated in one. Merging three blog sites into one brand would be the greatest challenge for everyone. Here what insights has been given is absolutely fine but in my opinion it would be better to have separated blog sites with their respective niche topics because Google would love the sites which have very few pages and the topic would be directly relevant to targeted phrases what people searching for, also you would find yourself very relax to maintain these small blog sites by saving enough time. If site becomes larger then Google consider so many factors to evaluate. Nice post -just one question, when you merge two sites together, what do you have to do to stop google thinking it’s duplicate content? If I want to move all of site b to plan a, then I’ve been told I should take site b down and that’s that. Do the 301 redirects need to be done if the site is not live? Will one from the homepage work if the rest of the pages haven’t had any links to them but have been crawled by google? It is really difficult to handle three websites instead of one. So, you have shared some of the important stats. Robin Khokhar recently posted..Organic Traffic – Why it is the best Source of Traffic? Thanks for this case study. it has help me to know, not just overview of what it takes and what will happen when one consolidate many websites they have. Usually it depend upon the person and may change. People also ave doubts about their rankings while making such changes, but this case study, will help to clear those doubts. Thanks so much for taking the time to join the conversation. I think this is a question that a lot of people have on their minds. It is a decision that is risky. As for Doreen, we redirected her old domain names to her new site. I still question whether we should have directed them to posts specific to the category that most closely corresponded to the old domain but Doreen chose to direct them to her home page. The biggest negative impact has been that she lost subscribers to her blog updates. That may be due to her re-branding efforts. In the past, Doreen did not have a logo for any of her websites. Now, all of her branding efforts are around her new Chocolatour brand. It’s very possible that her readers did not recognize her new emails as being from her and they quickly subscribed. She has recovered from that loss but we do not know how many people unsubscribed and then resubscribed. I was into your blog for the very first time and got a great idea. As a freelance writer i have written on the various topics which are not related to each other on different blogging site. So the response by the readers on various Niches differs. It is wonderful idea to merge different sites into one and categorize them separately. In this way the readers who have a special taste will not be wandering too much. It will help to get readers from various niches in one place and let them choose what they like. Will try your innovative idea and hope it goes well. I believe the answer to whether or not you should merge websites is whether or not the topics are of a common interest to your target audience. Otherwise, you risk alienating readers who are looking for a specific topic. One thing that we have not done yet is build specific landing pages that correspond to Doreen’s old domain names. For example, her old domain name, DiversionsWithDoreen.com, re-directs to the home page of chocolatour.net. I believe that we should have a page specifically geared to people who used to go to that site looking for travel posts. I believe that doing that would help retain those leaders. Thanks so much for taking the time to let me know that you found this helpful. If you choose to undertake this task, feel free to contact me. I may be able to help you. First of all, thanks for too much info and the case study. I do really like this case study. 3 merged sites are better than 1 single. As a far as, Google Analytics also proved this thing. This is my first time I am reading any case study related to merging websites. Ater reading this, my mind is also set to merge my blogs. It was a lot of work to undertake but in the long run, this strategy has paid off for Doreen. Since doing this, she has built a greater awareness of Chocolatour and she has been presented with many new opportunities. If you (or anyone else reading this) decide to merge multiple sites, feel free to contact me. I learned a lot in the process and I may be able to give you some tips. Good timing on this one. I’m currently considering merging three of my websites, as they are all to-do with business but separate parts of business. This case study scenario has helped, but it is still a big decision to make. The main cons that I’m thinking of is losing the domain name keywords, apart from that I want to merge them. I’ll have to test a few things out I guess, and see how it goes. Thanks for sharing this article, Sherryl! I’m glad you found my article helpful. When I was searching for tips/pitfalls on merging multiple sites, I found some useful info but I found more opinion than stats on what actually happened after someone went through this. Do you plan on keeping those domain names and doing permanent redirects? That’s what we chose to do. Good luck with your decision! Feel free to contact me if you have any questions about either our strategy or the process. I keep spreadsheets for each of my clients and I documented all the steps I went through. This is really an interesting project. Good to read all awesome stuff. Hello Sherryl Perry,What an excellent article. That’s a lot of lovely data though that you’ve shared and a ton of hard work on your part to make sure that Doreen was moving in the right direction.I’m really impressed with you. And, I totally agreed with this statement ”From the Google Analytics stats, you both certainly took the right path. If one site’s stats almost equate three, why spread the efforts and waste resources? I personally prefer one to many especially in a case like this when content can be merged. With concentrated efforts, we should have better results”.Thank you very much for this drill. Muhammad Tabish recently posted..Would You Join A New MLM Companies? Thank you so much for letting me know that you found my article interesting. I appreciate your feedback. I need to apologize to you for just replying to your comment today. Your original comment (which you left for me on March 22nd) somehow got attached to a post that I had written about Google’s ranking signal. To make matters worse, I never saw it until today. So, not only did I need to move your comment to the correct article, I am just now replying. I truly am sorry. Sherryl Perry recently posted..Do You Sell Online? Want To? I often saw blogger who has more than 3 or 4 blog sturgle to publish blog on all sometime they publish on first but ignoring one harms their blog too so they starts doing focus on only one blog so they left other blog that is bad idea but here you give nice way to go for managing all blog by merging. Ravinder Dande recently posted..How to Redirect Old URL to New URL in Blogger ? It is challenging to publish on multiple websites on a regular basis. In Doreen’s case, the content and her audience overlapped enough for it to make sense for her to merge her sites. In many cases, bloggers have created sites in different niches. I know many bloggers who manage that quite well. It’s definitely not a one-size-fits-all solution. Thanks for taking the time to join the conversation. It’s great to hear what everyone has to say about this topic. I hope you’re having a great week! This is really an interesting project that you indertook with Doreen: merging 3 sites together is about the biggest decisions in the life of any blogger or webmaster. Personally, my audience also overlapped – and then, I wanted to cater for a larger audience and avoid spreading myself too thin. In essence, I wanted a huge authority site that could brilliantly cater for all and treat it’s topics in the most masterful of manners. And I got it with the Notopoverty Information Portal. Do I regret merging multiple sites? No! Was I told I would regret it? YES! Today, the resulting authority site still brilliantly caters for the needs of all the readers that land there…because of it’s multi niche approach and my personal blogging touch, the bounce rate has gone down while the total time on page has gone up – by more than 500%! My final words are simple: building an all inclusive authority site is not the easiest of tasks…however, if anyone is interested and can pull it off, they should proceed…there is awesome power in focus and concentration. Do make the day great Sheryl! Thanks so much for weighing in on this. It’s good to hear from someone who shares a similar experience. An increase of time on page of more than 500% is impressive. 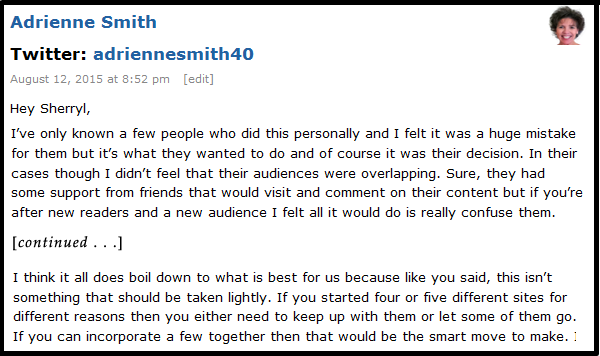 Hopefully, someone reading your comment (along with my post) will have the courage to forge ahead merging sites. I know that this strategy won’t work for everyone and (as I have stated here numerous times already) it is not a decision that should be taken lightly. However, it can be done successfully. Thanks for the kind words about my site. I’m glad you came back. I have to apologize to you for not having replied to you sooner. I’ve been having a bit of the “blogging blues” lately and I’ve been neglecting my site the last few months. There’s no excuse for not replying sooner. I do appreciate the time it takes to leave comments. Great post here. You surely did a lot of work in terms of finding the data to back up this post. I think it’s all up to the person if he/she is willing to put in more work and sacrifice a few things in order to merge different niches together. As for me, I would prefer staying targeted and organized. Thanks for sharing these insights. Great job on coming up with a great case study. Thanks for letting me know that you appreciate the work that went into this post. I apologize for taking so long to reply to you. (I’ve been going through a bit of the blogging blues lately but there’s no excuse for not replying to you earlier. It took me quite a while to do the research (and write this) but I felt that I owed it to my readers. Many people who took the time to comment on my original post were sincerely interested to find out whether or not this strategy proved successful. I’m happy to report that Doreen keeps me updated regularly and she is genuinely pleased with her new site. She credits it for helping her to secure several new assignments and sponsorships. I agree that we should stay targeted and organized. That’s certainly good advice for all of us. First time i am reading any case study about merging the websites and their positive results for getting more output from it and i am dam sure that this will be a great action and i will also try for it. Consolidating websites is definitely not something to take lightly but it definitely is a strategy that can work well. Doreen is extremely happy with the results that she is seeing now. In her case, it made sense. Good luck if/when you try this. If you have any questions during the process, feel free to contact me. I certainly learned a lot going through this process. I appreciate your taking the time to join the conversation and I hope you are enjoying your weekend. Merging two or more sites together is like a double edge sword, it could hurt you if your calculations, assumptions or reasons behind the decision is not right. On the other hand, it may yield a wonderful result if your sense of judgement is right. In my own opinion when it comes to a decision like this, the first point of consideration should be the readers. There definitely isn’t a one-size-fits all solution to this. It definitely could go either way. This was not a decision that either Doreen or I took lightly. We had been in discussion about this for over a year before Doreen made the decision to proceed with this strateg. In addition to working with me, Doreen hired a graphic designer to work on creating her Chocolatour brand. Her designer (Jennifer Cook from CatsInTheBag.com) did market research and tested her designs with focus groups. Additionally, Doreen ran her own focus groups including readers, authors, travel bloggers, clients and media people. Some of the feedback was very constructive and resulted in several changes to her graphic design. (One challenge was to not appear to be a bout recipes and cooking with chocolate.) Overwhelmingly, her readers agreed that having one blog rather than three was preferable. Thanks so much for taking the time to add your insight to the conversation. I agree with you that this decision was a difficult one. The good news is that Doreen’s new site is working for her as we intended. She’s getting more sponsorships and more media coverage. She is definitely off to a good start in 2016. Personally, I think there are a lot of variables in this and it really depends on the sit owner and what makes it easy for them. I believe there is an easy way create 3 separate landing pages that act like home pages and may even have their own theme based on a page type. From that landing page all the pages underneath it are in the context that home landing page. With that said, there is a case to be made for separate sites as well. In my opinion and based on the state of the web today it’s a matter of preference. In the end it still comes down to content and content promotion. I’m sure there is a lot more to say and consider but I think the big picture is important here and there is really no right or wrong anymore. Have a great end to your week Sherryl! I agree that it does depend on the site owner. For Doreen, this strategy fit her needs. Then again, she was willing to invest in a new brand. This effort went far beyond merging three WordPress websites. Since launching her new website, Doreen has been approached with several opportunities that were not previously available to her. She is definitely pursuing her dream and her new site is filling her needs far better than the three disjointed sites that she previously had. Keeping the big picture in mind is definitely good advice! Thanks so much for taking the time to share your insight with us. I saw on Facebook that you plan on taking a month long break from blogging. Good for you! sometimes you do need time to reflect, strategize and put new process in place. I’m glad to hear you’re continuing to network. Good luck! I’m sure we’ll be chatting online. Thx so much, Sherryl, for this post and the detailed analysis of what we have done with my sites. I really do feel that a huge weight has been lifted off my shoulders by combining my sites into the wonderful new mega site that you and Jennifer designed for me. I couldn’t be happier with the look and functionality of the new site. I will continue to work hard in building my brand, and couldn’t have come this far without your guidance and encouragement. Everyone should be so lucky to have an amazing web consultant like you. ? Thanks so much for weighing in on this. Analytics are helpful but one of the best testaments (to whether or not this was a good strategy for you) is that you’re happy. It’s always a pleasure working with you and Jennifer’s design was easy to incorporate. You definitely are building your brand. Thanks so much for the kind words. I value and appreciate your recommendations. I hope you’re having a wonderful time on Vancouver Island! Thanks for the kind words and for sharing your experience with us. It’s good to see that you were able to repurpose the content. I know what you mean about making your mental life easier. I’m sure Doreen feels the same way. It’s always nice to see you here. I appreciate your weighing in on this. I hope you have a great rest of the week and that you and your family have a Happy Thanksgiving. I personally think that combining the websites whenever possible and it makes sense to do so is the way to go. I love Doreen’s beautiful combined site and am happy to hear the statistics show things are going well. Specifically in that case, I think it was the right path to take. I agree that it makes sense in cases like Doreen’s. I would hate to see someone merge their blogs without really weighing the potential impact but I believe we were able to do this relatively seemlessly. Her site is beautiful. I give total credit to Jennifer Cook from CatsInTheBag.com for the design. Thanks so much for dropping by. I hope you have a wonderful Thanksgiving. 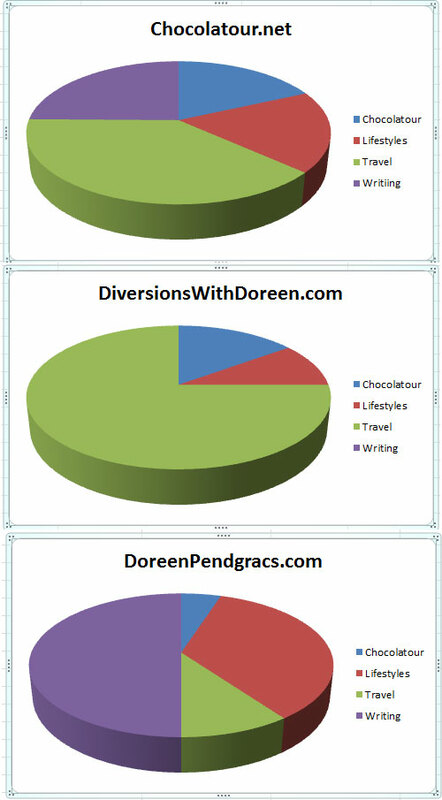 Looks like Doreen really had the same categories in all three blogs so merging them probably didn’t hurt her as much. That’s a little different than all three blogs having totally different subjects and nothing similar at all. That’s a lot of great data though that you’ve shared and a lot of hard work on your part to make sure that Doreen was moving in the right direction. I’m sure she’s so very thankful you helped her with this and I can’t ever imagine having more than one blog to keep up with so I’m sure she’s very thrilled with her decision. Since the numbers don’t look too far off it does seem like it was the right move to make. Great share Sherryl and a lot of hard work on your part. Like most of us who have been blogging for years, the number of categories Doreen had accumulated had grown. It took a lot of hard work (and commitment) on her part to narrow them down. Having fewer categories certainly makes navigating her site easier. That was a lot of data to compile but it was a good exercise and it confirmed what we believed to be true. As I told John (in my reply), I’m done looking back. From now on, we’ll be dealing with all her stats in one place. Doreen is thrilled to have her new site with her shiny new brand and everything in one place. It has made managing them easier for her. As always, thanks so much for adding your insight and your encouragement. I hope you’re having a great week. I really appreciate you coming back to what we discussed in the past with some updates. The truth is, everyone can never think same even if we were all to have the same data. There are lots of other factors that influence decision making. From the Google Analytics stats, you both certainly took the right path. If one site’s stats almost equate three, why spread the efforts and waste resources? I personally prefer one to many especially in a case like this when content can be merged. With concentrated efforts, we should have better results. Enstine Muki recently posted..What does the star mean on whatsapp? Here is the answer! It was a long time coming but I finally did write my follow-up. Some readers have been calling me in on that and I’m glad they did. There was a healthy discussion in the comments of my first post and I owed all my readers some more insight. My analysis of her Google Analytics isn’t perfect but I believe it’s a good indication that she didn’t lose a lot of traffic or readers. I’m sure she may have lost some but I know from speaking with her that while she lost some subscribers in the very beginning, she’s made up for it. Thanks so much for the feedback. I hope you are having a wonderful weekend as well. I agree. It does depend on what your niches are and if they blend. I believe that when Doreen started her blogs, they were clearly defined niches. As she focused more on her Chocolatour books, her content overlapped. As you know, Doreen used to post on a regular schedule to each of her sites but it became increasingly difficult for her because often, her post could be published on any one of her sites. That was a real dilemma for her. It sometimes came down to posting on one site over the other simply because she was “due” to post there. As far as I know, Doreen hasn’t received any negative feedback on consolidating her sites. What Doreen did do was to invest in her branding efforts. That was the key. Along with the launch of her new site, she updated all of her social networking profiles with her new brand. She also worked hard at communicating her new message..
Doreen also ran her own focus groups soliciting feedback from her readers and other people who she trusted while she was working on her re-branding. (This was in addition to the research and focus groups that her designer ran.) The design, the re-categorizing and all the behind the scenes work that we did was part of her overall business strategy. Thanks so much for weighing in on this. I know both Doreen and I appreciate your continued support. As for your site representing your personal interests, I hear you. I think it’s natural for us to question where we are with our blogs and where we’re headed. It’s probably healthy. It seems like so many web changes that the data doesn’t show a huge change. A couple points, to make it equal I would look at 90 day periods. Feb is a bit shorter, right… Isn’t going to have a huge change but when numbers are close every little bit matters some. I would also look at the previous 90 day (90 days before you show). Is the site going up something like 10% every 90 days? That could well be the case. For these sites it might not matter (but for some it will) and looking at comparisons to the same period the previous year can matter. Essentially I think the data shows there really isn’t much difference. In many ways having 1 site is easier to maintain so it might have a bit of an edge. And there may be advantages with it being more recognizable (so it sticks in users heads more if they use 1 site versus 3). On the flip side one advantage of 3 sites is you can get multiple instances in search results (where often search engines limit the number of times results from 1 site will be shown). Another advantage is if Google decides to downgrade search results for 1 site you still have 2 others that could do well. This isn’t that big an issue but there is a bit of not having all you eggs in one basket advantage to spreading out the sites. My practice is to have sites focus on a theme and add new ones only for new areas. So consolidating if you decide really they fit together is along with my practice (though I have never gone in that direction yet). Thanks for the suggestion to look at a 90-day period to avoid February being shorter. I hadn’t thought of that. Honestly though, there are so many variables in this analysis that I’m not sure that it would have made that much of a difference. At this point, I have no intention of doing any more analyses comparing the separate sites to the consolidated site. I think my energies will be best spent elsewhere. I agree with you that the differences seem minimal. Our goal now is to increase traffic going forward. Doreen is definitely enjoying being able to write for one blog instead of three. She often found herself having to write about a specific topic (for example travel as opposed to chocolate) simply because she was due to post to that particular site. That was a real problem for her. As for her site being more recognizable, that is definitely true because her branding effort was a major part of her new site. As part of the redesign, her designer (Jennifer Cook of CatsInTheBag.com) also created branded designs for her social networks. Doreen is really being recognized now as Chocolatour. Hopefully, Google will never decide to downgrade the search results for her sites! Thanks so much for taking the time to share your insights with us. That’s an interesting document that you linked to. I think overall, most bloggers don’t have a need to consolidate sites but in Doreen’s case, we (Doreen, Jennifer and I) believe it made sense.